Napa Valley is one of the premier travel destinations in the world. 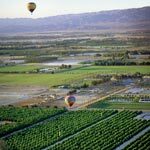 Breathtaking views abound at every turn - mustard in the late winter, picturesque rolling hills planted with vineyards year-round and wineries of every stature dot the landscape. Whether you are wine tasting, dining at renowned restaurants like the French Laundry, pampering yourself with a mud bath in Calistoga, or just enjoying your stay at the Westin…Napa Valley is your spot of heaven on earth. Award winning wineries, gourmet restaurants and epicurean delights, cultural events and exhibitions, one-of-a-kind shops and boutiques – the Napa experience is all of this and so much more. Discover beautiful restorations of historic buildings, enjoy world famous cuisine at La Toque and other acclaimed culinary destinations. Indulge in unique shopping, spa and nightlife experiences, all just a quick stroll from the hotel, and experience nearby attractions such as 12 winery tasting rooms, The Wine Train and Oxbow Public Market.